By Kingston - Flax by Surplice. Queen Bertha was the complete package, a first class racemare who became a top class producer. A homebred winner of the Epsom Oaks, she became one of the foundation mares for Lord Falmouth's Mereworth Castle Stud, producing, among others, the great racemare Wheel of Fortune and her half-sister Spinaway, both winners of the 1,000 Guineas and Oaks. Evelyn Boscawen, sixth Viscount Falmouth, was born in 1819, and inherited the title and the estate of Tregothnan, in Cornwall, from his father, at the age of 23. His father, a church canon, had inherited from a cousin, and was related to Admiral Boscawen. Boscawen married the wealthy heiress Baroness Le Despenser in 1845, and so also acquired her estate at Mereworth Castle in Kent. Here he established a stud which produced the winners of 19 classic races from crops bred there until he dispersed his stock in 1884. These included three Derbies, three St. Legers, five Oaks, three 2,000 Guineas, and five 1,000 Guineas. Falmouth entered racing in 1857, and his first classic winner was Hurricane (1859 by Wild Dayrell - Midia), winner of the 1,000 Guineas in 1862. As a broodmare for Falmouth, she produced the 2,000 Guineas winner Atlantic (by Thormanby), which the breeder sold to France, where he was very successful, counting Le Sancy among his most important progeny. The roll of honor at Mereworth continued with Queen Bertha and her brood (including SPINAWAY, WHEEL OF FORTUNE, and Spinway's daughter Busybody, all Oaks winners), as well as Derby winners Kingcraft, Silvio (the first Derby won by Fred Archer), and Harvester; and other classicists Gamos, Cecilia, Jannette, Charibert, Dutch Oven, and Galliard. Falmouth preferred to use outside stallions rather than standing his own, an option that allowed him to sell his good colts, and freed up breeding choices for his mares. Queen Bertha was born in 1860, by Kingston out of Flax by Surplice. Kingston (by Venison) was an outstanding stayer in his day, winner of the Goodwood Cup, Epsom Cup, and second in the Ascot Gold Cup to West Australian (with Rataplan third). A useful sire, he got Caractacus, the winner of the Derby in 1862 (the year before Queen Bertha's win in the Oaks), and the Ascot Gold Cup winner Ely. His daughters became valuable broodmares, and besides Queen Bertha, included Silverhair (dam of Derby/St. Leger winner Silvio), Babta (dam of American champion and leading sire Glenelg), Eltham Lass (dam of Belmont/Travers Stakes winner Kingfisher), and Coimbra (dam of Stonehenge, Claremont). Flax was unraced, but a daughter of Derby winner Surplice. 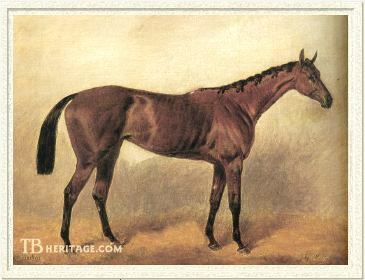 Flax's dam, Odessa by Sultan, was a sister to 2,000 Guines winner Ibrahim (a classic sire in France), to Ishmael, and half-sister to Flycatcher. The next dam was a sister to Cobweb, by Phantom. After Queen Bertha, produced King Tom's daughter Reginella (dam of Guy Dayrell) and Stockwell's useful sire son Honiton. Lord Falmouth sent the filly Queen Bertha to his trainer, John Scott "the Wizard of the North," who trained at the Whitewall Stables in Malton, Yorkshire. She raced in her owner's colors of black, white sleeves, red cap. As a two-year-old, she ran four times, winning once and second three times. At the time, Falmouth was using the pseudonym "Mr. T. Valentine" and this is the name in which she was entered for the Oaks the next year. Queen Bertha, however, was unimpressive in her works, and lost her first race back at three, discouraging her owner enough to suggest scratching her from all stakes engagements, including the Oaks. Scott knew his charge well, though and pleaded her case. Queen Bertha vindicated her trainer and in the Oaks, finished strongly to defeat Marigold (later the dam of Doncaster) by a head. She then won the Triennial Stakes at Ascot. Queen Bertha was also second to Lord Clifden in the St. Leger Stakes, and second in the Doncaster Cup to Macaroni, and second in the Ascot Derby. She made only one start at four, although unplaced in the Goodwood Cup, and retired with a record of three wins in ten starts. Ulbrich notes that Queen Bertha was the last of the 41 classic winners sent out by John Scott. In 1867, with Scott's health declining (he died in 1871), Falmouth shifted his horses to William Boyce, and the next year, Mathew Dawson at Heath House to train for him until Falmouth's retirement from the sport. Retired to Mereworth Castle Stud, Queen Bertha produced ten foals, starting with GERTRUDE, a bay filly of 1867 by Saunterer. Gertrude ran 29 times from two to four and won eight races including the Yorkshire Oaks, beating Frivolity and Falmouth's own Gamos who had won the Oaks that year. Gertrude also won the Great Yorkshire Stakes (14 furlongs). Gertrude's best son was Charibert (ch.c. 1876 by Thormanby), winner of the Champagne Stakes at two and the 2,000 Guineas at three. Like Atlantic, Falmouth also sold him to France, where Charibert became a successful stallion. Gertrude also produced Prendergast Stakes and Doncaster Stakes winner Childeric (c. 1875 by Scottish Chief), also second in the St. Leger and third in the Derby. Gertrude's unplaced daughter Galanthis (b.f. 1883 by Galopin) was the dam of Cheveley Park Stakes winner Merula, while another daughter, Galeta (1900 by Ladas) produced Doncaster Cup winner Amadis. Gertrude's daughter Mabella (1884 by D'Estournel) was a useful mare and her female line through My Beauty is strong in America. Queen Bertha's second foal was QUEEN'S MESSENGER, a bay colt born in 1869 by Trumpeter. Third in the 2,000 Guineas and Derby Stakes, he won the St. James's Palace Stakes and Prince of Wales's Stakes. Although not a great sire, he got a few good daughters in Royal Letter, Emmeline Marcia, and Reprieve. In 1870, Queen Bertha produced the chestnut colt PALADIN by Fitz Roland. He went to stud in France but left little of value. Queen Bertha's foal in 1871 was the bay filly BLANCHEFLEUR, by Saunterer, so a full sister to Gertrude. She did nothing noteworthy on the track, but as a broodmare produced Syringa (f. 1878 by King Lud). Syringa was a minor stakes winner at two, but more important as the dam of unraced Venus' Looking Glass (1885 by Speculum), who, through her daughter Hettie Sorrel (1891 by Peter) is the second dam of Marchetta and her great brood through daughters Sweet Lavender (to My Babu, Turn-To, Ambiorix, Klairon) and Rose Red (to Borealis, Alycidon, Acroppolis, Agricola, Moonstone, Paving Stone). Queen Bertha's sixth foal was SPINAWAY, a bay filly by Macaroni foaled in 1872. Spinaway won 11 of 16 starts including the 1,000 Guineas and emulated her dam by also proving victorious in the Epsom Oaks (in which Falmouth's Ladylove was second), as well as winning the Newmarket Oaks, Nassau Stakes, Doncaster Stakes, Royal Stakes, and second in the Ascot Derby. Spinaway produced stakes winners Busybody and Merry-Go-Round (by Scottish Chief, won Newmarket Stakes). Busybody (1881 by Petrarch) was an outstanding racemare, winner of the Middle Park Plate, Rous Memorial, and Great Challenge Stakes at two. At three, she was the undefeated winner of the 1,000 Guineas, and Oaks, and thus the third in this rare female line of successive Oaks winners. Busybody herself became an important broodmare. Three-year-old Busybody (along with that year's Derby winner Harvester), was one of the drawing cards at Falmouth's dispersal sale in 1884 and was purchased by George Abington Baird. Busybody became a valuable broodmare. Her most important foal was Meddler (1890 by St. Gatien), who was undefeated as a two-year-old and when sent to the U.S., became the Leading Sire in 1904 and 1906. Busybody also produced the broodmares Bass (granddam of French 2,000 Guineas winner Le Traquet), and Meddlesome. In 1873, Queen Bertha produced the bay filly FAME, by Trumpeter, so a full sister to Queen's Messenger, but she left no impression on the race course or as a broodmare. The next year, in 1874, Queen Bertha produced another foal by Trumpter, this one was the chestnut colt QUEEN'S HERALD, but like Fame, was not useful to Falmouth or anyone on the track or at stud. Then, in 1876, at the age of 16, Queen Bertha gave birth to the best runner she would produce, and one of the best of the century -- WHEEL OF FORTUNE, a bay filly by Adventurer. She was the best runner bred by Lord Falmouth. Her jockey, Fred Archer, thought so highly of Wheel of Fortune, that he said the she, among mounts that included Ormonde and St. Simon, may have been the best he had ever ridden. She won ten of eleven starts, only losing when breaking down in her final start. At two, Wheel of Fortune was undefeated in six starts including the Richmond Stakes, Prince of Wales's Stakes, Buckenham Post Produce Stakes and Dewhurst Stakes. At three, she won four of five starts including the 1,000 Guineas, Oaks, Yorkshire Oaks, and Prince of Wales's Stakes. In the Great Yorkshire Stakes, she was second to Ruperra, but had broken down in the running and gamely held on to the place. This proved to be her last start. Wheel of Fortune Wheel of Fortune was a disappointing producer, however. She was purchased by the Duke of Portland at Falmouth's dispersal in 1884, but the change of location did not change her fortunes as a broodmare. She was buried in the Welbeck Abbey horse cemetery when she died in 1903. Her son Oberon (1883 by Galopin) sired a few good broodmares, including the dams of Irish Derby winner Killeagh, and the Desmond horse, Fairy King. Wheel of Fortune's daughter Ouagle (by Galopin) became the ancestress of the French runner and sire L'Oriflamme (1930). Queen Bertha's last two foals were GREAT CARLE (b.c. 1878 by Macaroni) and GRANDMASTER (ch.c. 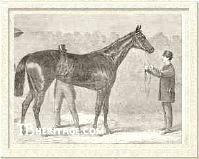 1880 by Kingcraft), neither of which did anything to enhance their dam's reputation on the track or at stud. Grandmaster was Queen Bertha's last foal. 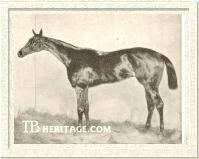 As an expression of her influence, Queen Bertha was designated in Bobinski's Family Tables of Race Horses, as the founder of the 1-w branch of Bruce Lowe's Family 1. Although her greatest runner, Wheel of Fortune, failed as a producer, Queen Bertha's influence through daughters Gertrude, Blanchefleur, and Spinaway ensured her family's strength for generations to come.